Working in concert with SAP’s customers, the Utopia/SAP cumulative experience has delivered hundreds of successful SAP implementations. Today, Utopia’s migration methodology is regarded as an industry best practice, using SAP Data Services and Information Steward for analysis, mapping, validation, enrichment, data loading, dashboards and reporting. Our core data migration process is applied to every SAP Data Services project. Utopia goes through a stringent quality assurance audit when creating solutions for SAP Data Services or data migrations. Only SAP-focused developments that pass the audit become a part of the Data Migration Jumpstart process, which provides templates that aide in reducing timelines and compressing the effort while ensuring a high level of consistent data quality. For over a decade, Utopia has refined hundreds of ready-to-use templates spanning more than 22 industries. Furthermore, utilizing the Utopia templates can strengthen and ensure that all SAP Data Service developers are programming the same way and in accordance with the same standards—more consistency translates to higher quality. Data Migration Jumpstart provides a logistic charter for SAP Data Services solutions that help access, connect, prepare, remediate, test and load data. With it you have an industry proven, out-of-the box data validation, enrichment, and migration solution. As a result, it enables you to get started immediately, mitigates risk and increases efficiency. This insures a successful, on time and within budget data migration that includes repeatable components for future projects. Utopia’s accelerators harness the true power of SAP Data Services and can be fully integrated with SAP Information Steward. This creates a unified platform that provides clear visibility into the quality of your data via user friendly, customizable dashboards and reports. From C-levels to data stewards, Utopia’s integration capabilities enable you to keep pace with your business and data requirements, assuring true data quality day in and day out. Saves time and lowers implementation risk with the use of proven, pre-built templates and accelerators that are tuned to meet implementation needs. Reduces ramp up time through pre-built forms, reports and workflows. Delivers seasoned expertise pertaining to SAP Data Services at an industry and functional domain level. 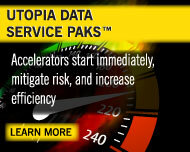 Accesses Utopia’s data migration library that covers an extensive list of legacy system formats. Data experts handle the scope and complexity of an SAP implementation. Enables internal resources to focus on other tasks. Addresses data quality and data governance issues prior to implementation. As a data expert and SAP Partner, Utopia has extensive knowledge of data objects and how they align to SAP implementations for specific SAP modules. Utopia has pre-built templates and data flows already configured to expedite the preparation process for implementing SAP modules.